My Tarokka deck needs something to do. It’s not that I don’t love the purchase. It’s a wonderful item with a lot of great art. Worth every penny. But I feel like I can make it worth more. As I mentioned in my one-shot Strahd post, I’m not currently playing Curse of Strahd. Even if I were, I’d want to make expanded use of the Tarokka deck. It’s great for readings, but wouldn’t it be awesome if it could be used for random encounters, treasure tables, and more? It totally can. Whether you’re playing Curse of Strahd or not, you can draw cards from your Tarokka deck instead of rolling dice on a random table for encounters, treasure, and more. I’ve made it super easy for you and myself by writing out the numbers on a table below. I’m aware that other than the d6 column, these cards don’t perfectly correspond to the same probability as a throw of an actual die. If this were a saving throw, ability check, attack or damage roll, I wouldn’t allow it. For a DM’s random table this is close enough. It’s as good as it’s going to get without adding extra cards to the deck! Making players draw these cards themselves for treasure and encounters is especially fun. It adds a moment of drama at the table as you whip out the cards and ask them to draw. Psychologically it also shifts the onus of the result on the player as the others watch, hoping for a good result. 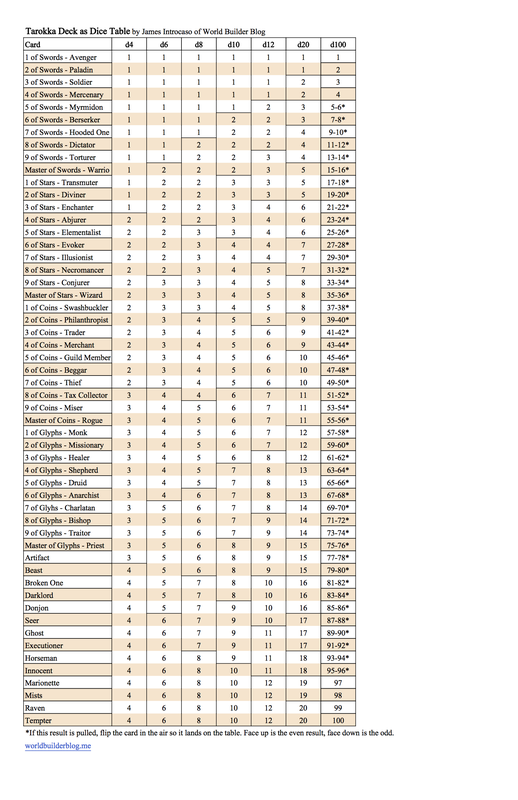 Check out the table below, or grab it in the link below as a PDF or from the Free Game Resources section of this site. 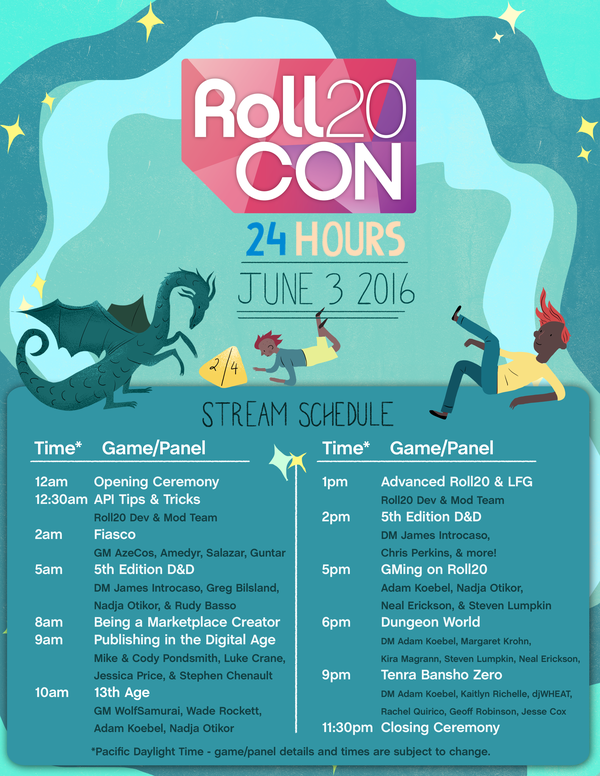 If you haven’t seen the schedule for Roll20CON check it out below. You’ll notice I’m running two games during the 24-hour live stream with some of the biggest names in Dungeons and Dragons including my good friend Rudy Basso of the Tome Show’s D&D V&G podcast and Have Spellbook, Will Travel, Nadja Otikor of Misscliks D&D Prophecy, Greg Bilsland of Wizards of the Coast and member of the Dungeons and Dragons team, and, oh yeah, Chris Freakin’ Perkins, a Wizards of the Coast D&D employee who needs no introduction. Absolutely. The beginning of Curse of Strahd talks about which cards in the Tarokka deck correspond to which cards in a standard. I’m currently writing a home-brew campaign where the characters are going to meet an old woman in a shack in the woods. She reads their fortunes, boom. I know it’s not REALLY far outside what the deck was meant for, but I’m stacking the deck so that the card draws aren’t random, and actually will give a little hint to each character on what lies in store for them. In fact, I went through the deck and picked out the cards I liked and then am adding NPCs or plot points that match the cards. Nice! That’s a great way to use it! I’m running Curse of Strahd, but have converted it to Savage Worlds. We’ve been playing that for a while, and I just didn’t feel like learning the 5e rules, but I still wanted the awesome story. I use the cards to determine initiative in place of the standard deck required by Savage Worlds. I also have a character who died and was resurrected by the Abbot who has a vision once per session, and the cards are handy for that. I usually have him select two cards, and his vision has two parts. I have a pretty good idea going in what the first part of the vision is going to be, but I make up the second part on the spot based on the card. The Savage Worlds game system is a little more focused on action than role-playing, so the characters generally lack the divination magic the module requires.